First Team's making a splash with the HydroChamp Adjustable Swimming Pool Basketball Goals! 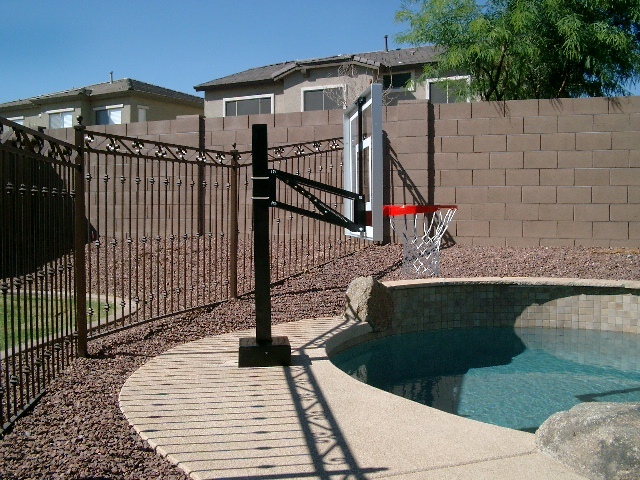 The HydroChamp Swimming Pool Basketball Hoop makes a great unit for adjustable poolside basketball. The bolt down 4"x4" stainless steel post and adjustable carbon steel arm system combine for a durable, economical and aesthetically pleasing poolside unit. All components are powdercoated black. 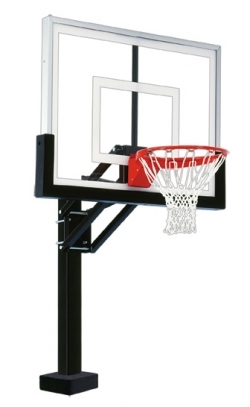 To adjust the backboard height, simply release the adjustment mechanism located behind the rim. Unit has a 30" rim adjustment range, adjustable in 6" increments. Unit is secured to swimming pool deck using anchor bolts supplied with unit. Anchor base cover is also included. Chose from three backboard sizes 48", 54", 60". 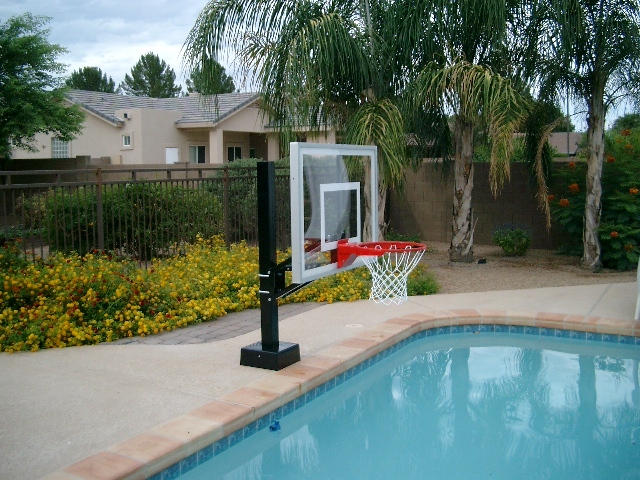 The HydroChamp Adjustable Swimming Pool Basketball Goal is the perfect unit for anyone looking for a high quality, professional looking poolside basketball unit. 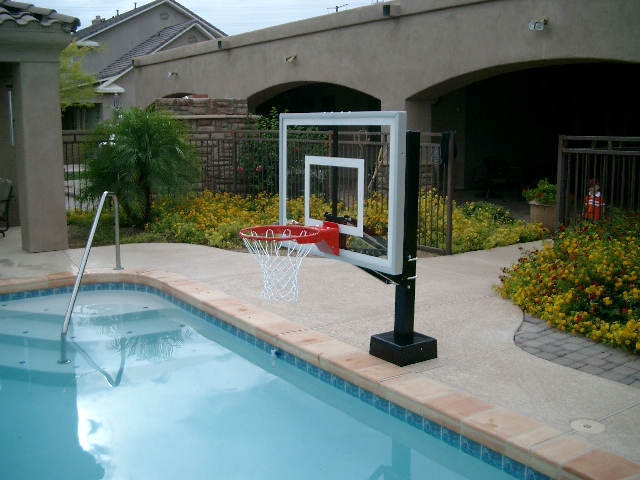 Give your pool the home court advantage with First Team's HydroChamp! 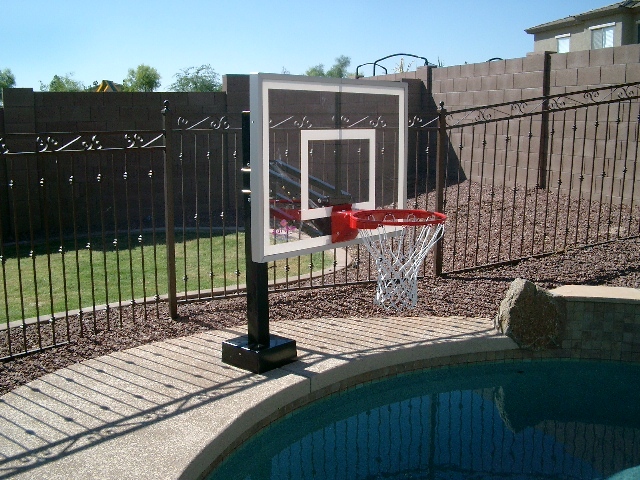 Each HydroChamp Adjustable Swimming Pool Basketball Hoop package is covered by our Lifetime Limited Warranty!